The EYDC was organized in 7 EU Member States (France, Germany, Italy, the Netherlands, Poland, Spain, and the United Kingdom), between May and September 2017. Following the National Finals, a passionate debate took place in Berlin amongst the national winners at the European Finals. Karl-H Foerster, Executive Director of PlasticsEurope added: “This initiative was launched to promote STEM education and to show to a young generation the importance of science. Education in these fields are of crucial importance for the future of our industry and the overall competitiveness of the European Union”. 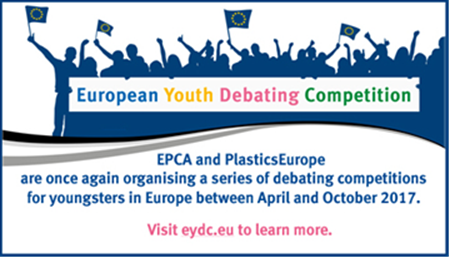 EPCA and PlasticsEurope have launched a new series of the European Youth Debating Competition (www.eydc.eu) targeting young students aged 16 to 19, throughout Europe. The main objectives of the European Youth Debating Competition (EYDC) and its organizers from the petrochemical and plastics industry, are: to promote STEM education (Science, Technology, Engineering and Mathematics), to empower students with soft skills and to encourage them to further discover and exchange on the contribution of petrochemistry and plastics in the digital age. Whilst for industry, it is an opportunity to listen to the views and expectations of the next generation of leaders. Technological dimensions of this new era with sustainable mobility, energy efficiency, smart living, societal wellbeing, are key ingredients for the future of both industry sectors and the overall competitiveness of the EU. Based in Brussels, EPCA is the quality network in Europe for the global chemical business community consisting of chemical producers, their suppliers, customers and service providers. It operates for and through more than 700 member companies from 54 different countries. EPCA provides a platform to meet, exchange information and transfer learning, and serves as a think tank for its members and stakeholders. EPCA promotes STEM education, with a clear focus on gender and diversity inclusion. EPCA also highlights the multidisciplinary approach and the variety of challenging career paths that the chemical industry offers. PlasticsEurope is one of the leading European trade associations with centres in Brussels, Frankfurt, London, Madrid, Milan and Paris. We are networking with European and national plastics associations and have more than 100 member companies, producing over 90% of all polymers across the EU28 member states plus Norway, Switzerland and Turkey. The European plastics industry makes a significant contribution to the welfare in Europe by enabling innovation, creating quality of life to citizens and facilitating resource efficiency and climate protection. More than 1.45 million people are working in 62,000 companies (mainly small and medium sized companies in the converting sector) to create a turnover above 350 bn EUR per year. The plastics industry includes polymer producers - represented by PlasticsEurope, converters - represented by EuPC - and machine manufacturers - represented by EUROMAP. For further info see the web links: www.plasticseurope.org, www.plasticsconverters.eu, www.euromap.org.